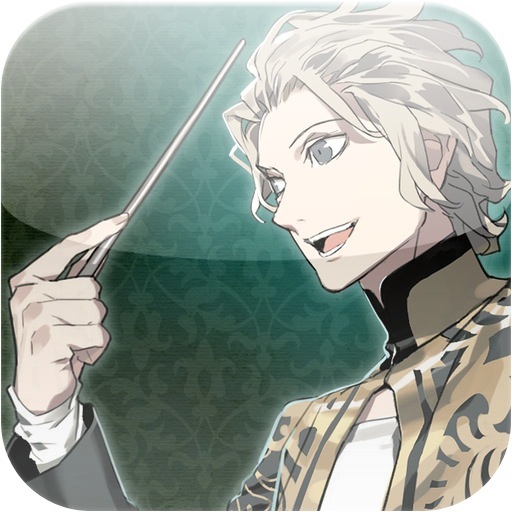 Considering Square Enix’s recent foray into music rhythm games, I admit I was a bit surprised to see something as standard as Symphonica (Free) hit the App Store. However, just because it conforms to genre norms doesn’t make Symphonica necessarily bad. In fact, with its emphasis on classical music and easy controls I’d say this music game is pretty enjoyable, though a superfluous story and a somewhat lacking song selection are the biggest detractors holding Symphonica back. 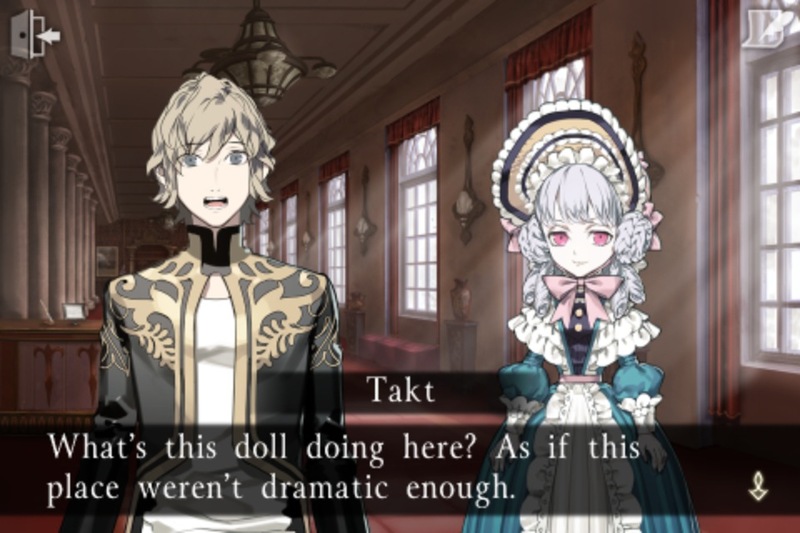 Symphonica follows the story of a young conductor named Takt as he heads to Einsatz, the city of music. After arriving, he teams up with the Fayharmonic Orchestra on a journey to play at King Hall, a musical tradition that hasn’t been accomplished since the time of the legendary conductor Carlos. Along the way, Takt encounters friends, enemies and ghosts of the past as he and the Fayharmonic rehearse and play music. If it seems like I’m making too big a deal about the story, it’s only because Symphonica consistently puts it in the limelight. In reality, Takt’s tale is full of anime cliches, both in narrative and visuals. While the story does give motivation to the songs you play, I didn’t find it particularly necessary (or desired). However, in order to unlock songs for the standard ‘Concert’ mode, you have to play through the corresponding story chapters. Thankfully, most chapters are fairly short, and you can fast forward through most of the narrative to the actual gameplay if desired. As a music game, Symphonica is about as simple as it gets. Notes scroll across the screen from right to left on a single line and your goal is to tap the screen right when the notes hit the “staff" line. Taps are judged based on timing (Bravo, Good, OK, Miss), with performances ranked based on total score. Of course, the game throws other notes at you too, such as double notes (two-fingered tap), sustain notes (hold for certain amount of time), swipe notes (swipe in the direction given) and more. Symphonica doesn’t feature ‘hot-spots,’ meaning that players can tap anywhere on the screen to register hits. 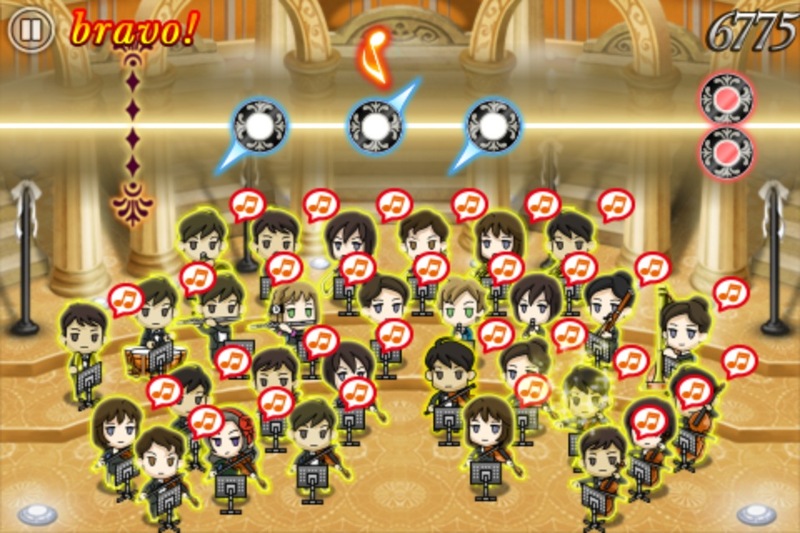 Other than one or two types of notes (such as the note that slowly requires you to hold and pinch), Symphonica’s rhythm gameplay is nothing new. True, this makes the game pretty approachable for both veterans and newcomers alike, but in some regards it also makes it a bit lackluster. This is especially true during the initial story playthroughs as the rehearsals and full performances are originally played at the lowest difficulty with subsequent, harder attempts unlocked afterwards. Still, the gameplay and controls do little to detract from the experience. At this point, Symphonica’s greatest strength is its song selection, which keeps the rest of the game together. As its name implies, Symphonica’s song selection is centered around classical orchestral tunes. While the App Store description touts 50 songs, in reality you’re really only getting 20 ‘full performances’ and some 30 rehearsal pieces (which are basically short clips). Thankfully, the full performances featured are great timeless pieces that really haven’t been found in other music titles. For me, there’s something about playing Beethoven’s ‘Symphony No. 6, “Pastoral" that really makes the game. Meanwhile, other pieces like “Wedding March" and “Pomp and Circumstance" offer recognizable songs while hopefully teaching players that there’s more to those selections than the snippets played ad nauseum in today’s society. My biggest complaint regarding songs is the limited selection, but I suppose one can do far worse than 20 songs in an iOS music game. If you’re not certain whether a rhythm game based on classic music is up your alley, Symphonica allows you to play the first three story episodes for free. Subsequent episodes (and the songs associated with them) are available via a variety of in-store purchase options. In this regard, I’d recommend Symphonica for anyone even remotely interested. It’s not the most innovative or engaging music game on the market, but the song selection is pretty unique and is well worth checking out on its own.